ExecuJet Aviation Group has received accreditation by the International Standard for Business Aircraft Handling (IS-BAH) for its FBO in Zurich, becoming the first FBO in Switzerland and one of the first across Europe to hold this industry-leading certificate. The IS-BAH is a global code of best practices for business aviation ground handlers assessed through a safety management system, which crucially recognizes that FBOs need to plan and conduct operations in a standardized way. The IS-BAH follows the long established structure of the IS-BAO program, used by operator clients, and is a joint program between IBAC and NATA. It incorporates the NATA Safety 1st ground audit program and is assessed externally by an IBAC-accredited auditor, who recognizes conformity to the standard with an IBAC certificate of registration. 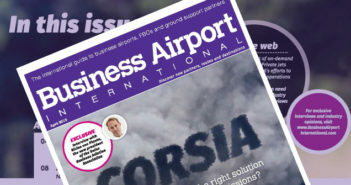 For more information, read Stamp of Approval in the October 2014 issue of Business Airport International.